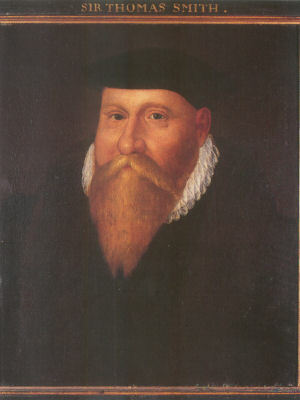 Queens’ College Old Library has an association with Roger Ascham (1515-1568), the pupil of Sir Thomas Smith (Queens’ fellow and humanist, 1513-1577). Ascham was taught by Smith while a student, and then became his scholarly contemporary as a fellow at St John’s, Cambridge. They were both avid Classicists and dedicated humanists. According to Thomas Smith, Ascham lectured frequently on Isocrates, who was a major influence on Ascham in addition to Cicero. 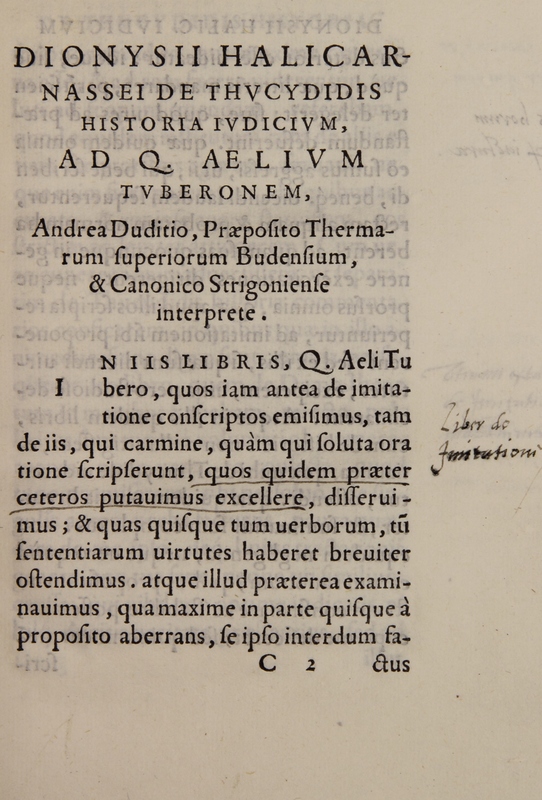 The Library possesses an annotated volume containing two of Ascham’s Classical books, bound together in limp Italian vellum (Andreas Dudito Pannonio, Dionysii Halicarnassei De Thucydidis historia iudicium (Venice: Aldus Press, 1560) and Paul Manutius, Demosthenis Orationes Quatuor contra Philippum (Venice: Aldus Press, 1551) – shelfmark: C.9.15) . We also have an excellent copy of schoolmaster James Bennett’s edition of Ascham’s own life’s works and letters, with an introductory life of Ascham by Samuel Johnson (The Works of Roger Ascham, London, 1771; shelfmark: D.3.26). It should be plain that Ascham’s inscription was written in his last year alive on earth, in London. Whether the rest of his annotations and markings are also only from his last year is unknowable – as only this inscription is dated. For those who remember their history lessons, in 1568 Queen Mary I (Queen of Scots) was imprisoned by her sister Elizabeth I. Ascham died 30 Dec 1568 from serious illness. Ascham’s marginal notes comment on the Dionysius text. He mainly makes comments on how easy or difficult certain passages are, and underlines important passages. They are notes made with a teacher’s eye. The Dionysius of Halicarnassus text is a Latin translation by Andreas Duditus – ‘without which the Greek is unreadable’ – and the Demosthenes was translated by the third son of Venetian printer Aldus Manutius, Paul Manutius. 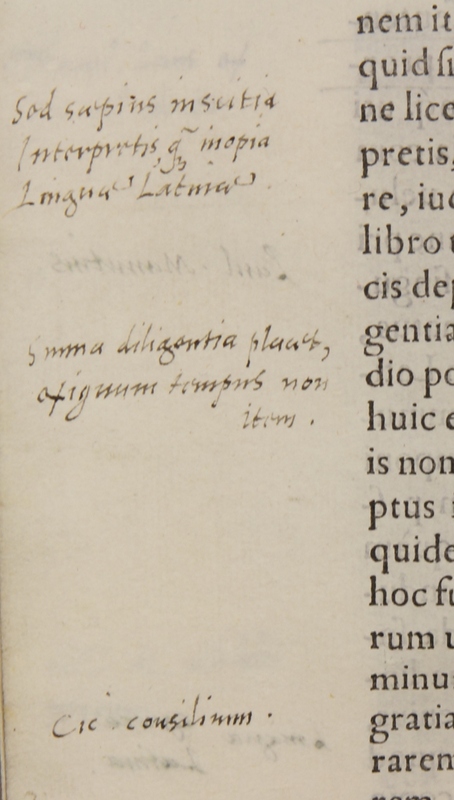 There are no notes on the Demosthenes, but Ascham’s binding the two together by 1560 might be a good indication he approved of that translation, too. Notes with an educator’s eyes. According to Smith, during Ascham and Smith’s time at Cambridge in 1542, there was a large debate in the University over the new pronunciation of Greek put forward by Erasmus, with which all students of Classical Greek today are still taught. Reportedly, Ascham was a staunch defender of the new pronunciation, but soon left Cambridge because he was becoming ill with worry over the matter. Ascham’s love of Classical languages, something he shared with Thomas Smith, who dedicated all of his Latin and Greek books to Queens’ College, formed the basis of his advice about what to teach young English gentlemen. And after a conversation with Sir Richard Sackville (Chancellor of the Exchequer, 1559-1566) on gentle schoolmasters fondly remembered, Sackville invited Ascham to write a book on the topic, and this formed the ‘how’ part of his teaching advice in The Scholemaster. Marginal notes and underlining by Ascham. The works by Dionysius of Halicarnassus and Demosthenes in Latin and Greek may have accompanied him during his extensive travels (and occupational changes) around England and the globe. When Ascham fell out with Elizabeth’s steward he returned briefly to Cambridge in 1550, and Elizabeth is reported to have had fond memories of him. After some time he was appointed ambassador to the Spanish Emperor Charles V from 1550-1552, after which he returned to England, married a woman called Margaret Howe, and was tutor to Mary Queen of Scots for a year. In 1554 he became presbyter of York Minster until 1559, and MP for Preston in 1560.3 Sometime during these years he came to possess these two books, bound together, Dionysius of Halicarnassus’ De Thucydidis historia iudicium (Venice: Aldine Press, 1560) and Demosthenes’ Orationes (Venice, Aldine Press: 1551). Beautiful handwriting and underlining by Ascham. Because of his beautiful handwriting he was also appointed as writer of official letters during his time at the University of Cambridge. He was also a Greek orator in Cambridge. It is remarkable to have the books of so instrumental a humanist and educationalist, whose popular work on teaching influenced generations of English schoolmasters to be kinder and teach even more Latin and Greek, and who was an early advocate of nonviolent classroom teaching. 1. Roger Ascham, ed. James Bennett, The Works of Roger Ascham, preceptor to Queen Elizabeth, London, 1771. 2. Sir Thomas Smith, De recta et emendate pronuntatione Graecae linguae, 1568. 3. J. Venn and J. A. Venn, eds. “Ascham, Roger”, Alumni Cantabrigienses, 10 vols, Cambridge University Press, 1922–1958 [online edition].